SaaS vendors and Corporate IT, a new detente? In 2013, SaaS, Mobile and Big Data (the ‘Big 3’) have moved on from visionary ideas well into disruptive realities impacting IT. IT is no longer in denial, as they were for much of the last decade, and in fact are “leaning in” on all fronts. According to CIO Magazine’s 2013 CIO survey, more IT organizations are focusing on building better relationships with the lines of business, and are raising their game and engagement into LOB projects, particularly around SaaS selection, implementation, and integration. By proactively anchoring the adoption of these Big 3 technologies, IT can rapidly connect them with core data and business processes to create new value networks and online services for the Enterprise. Enterprises are each choosing a uniquely diverse and ever-growing set of best-of-breed applications to power their business. However, this also creates new silo’s of processes and data. While this is an old story from client server days (data silos), this time it’s combined with an order of magnitude more endpoints (many outside the firewall), and this time the data is hidden behind API’s (there’s no direct access to the database the cloud). In this new era, Enterprises can be overwhelmed by the resulting explosion of endpoints, and API’s, or they can seize the opportunity and gain competitive advantage by connecting everything quickly and easily. Here’s where SaaS providers come in. The future for SaaS, and iPaaS in the New Enterprise is bright. More and more enterprises are selecting SaaS as a part of strategic technology purchases. Most public SaaS companies are growing 15%+ YoY (ServiceNow hit 55% top line growth), compared to Oracle and SAP who are struggling to maintain single digit growth in their Applications business. In addition many forward leaning CIO’s are taking a Cloud first approach to technology purchases. MuleSoft grew more than 170% last year, with more than half it’s business driven by Cloud and SaaS centered projects, while traditional on-premises middleware companies like Informatica and Tibco grew 3.5% and 5% respectively. API’s are the new table stakes, and you are not alone. To differentiate yourself in the new Enterprise, your application needs to connect. From existing customer systems such as SAP, Oracle, IBM, and PeopleSoft in addition to new best of breed applications such as Box, QuickBooks, Jobvite, or HubSpot, MuleSoft can help. Without these pre-built integrations, survey respondents confirm that integration is one of the top customer objections in their sales cycles, the #1 barrier customer implementation times, and directly impacts higher churn rates. 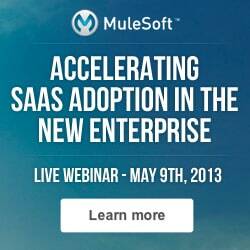 Learn more about the new Enterprise and how you can ensure your company is well positioned to win new business by attending our upcoming webinar, Accelerating SaaS Adoption in the new Enterprise on May 9th.